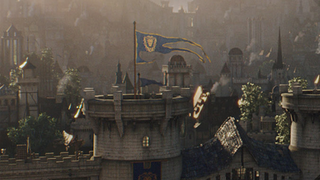 For nearly 11 years, World of Warcraft gamers have soared over the Alliance Capital of Stormwind on their flying steeds, but now you can get a sneak peek of a similar scenario for Duncan Jones’ Warcraft movie for yourself, as well as a fantastic first look at the location re-imagined for the big screen. A bit more dense, isn’t it? There’s a few changes eagle-eyed fans will be able to notice aside from the huge increase in scale, though. It’s cool to see some of Warcraft’s most iconic locations being brought to life,especially when we you get to take a look for yourself in neat VR experiences like this. The youtube video also works with Google Cardboard, so if you have one you can experience it in all its VR glory too! Warcraft is due for release in Summer 2016.